Based on exclusive and unrestricted access to more than 5,000 pages of personal writings and family photos, this definitive biography of German physician and SS-Hauptsturmfuhrer Josef Mengele (1911-1979) probes the personality and motivations of Auschwitz's "Angel of Death." From May 1943 through January 1945, Mengele selected who would be gassed immediately, who would be worked to death, and who would serve as involuntary guinea pigs for his spurious and ghastly human experiments (twins were Mengele's particular obsession). 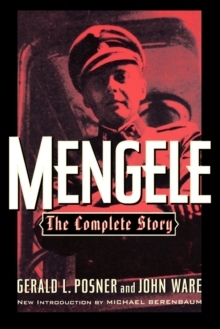 With authority and insight, Mengele examines the entire life of the world's most infamous doctor. Publisher: Cooper Square Publishers Inc.,U.S.